Disclaimer: This review may contain minor spoilers. Watch out! I haven't seen any of Dario Argento's other films, but from looking at reviews on IMDb, it isn't hard to see that Phenomena (or Creepers, as it was retitled for its heavily edited U.S. release) was a hit or miss for fans of his other works. So why did I decide to watch a film like this? Well anyone who knows about Phenomena's influence on the 1995 survival horror game Clock Tower ~The First Fear~ will understand why this movie piqued my interest. "A movie that is like a movie of Clock Tower? I'm there" I probably said to myself naïvely. But that's where I went wrong, because apart from some aesthetic similarities, such as the main character Jennifer looking like well erm... Jennifer from the game (see, even the first names are the same! ), as well as some other minor detail similarities, Phenomena is no 'Clock Tower: The Movie' (they are actually making a Clock Tower movie, but it has been stuck in 'development hell' for some time) but a movie wonder of its own. I went in expecting some random b-movie style horror film that just so happened to be an influence on one of my all-time favourite games, but perhaps my ignorance paid off, because it meant my expectations weren't at any level and I came out having watched something that I thoroughly enjoyed. 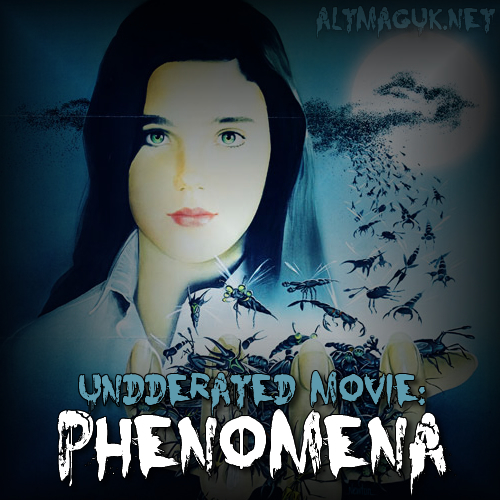 The story of Phenomena revolves around protagonist Jennifer Corvino (played by Jennifer Connelly) who arrives at an eerie Swiss boarding school for girls. After getting into a spot of bother while sleepwalking she gets lost in the woods and is found by the chimpanzee assistant of forensic entomologist John McGregor (Donald Pleasence). McGregor witnesses that Jennifer has a special gift for telepathy with insects, and asks her to go on a journey to find a killer of girls, with the help of a fly. She uses the fly, which is drawn to decaying human flesh, to help her track down the murderer. Obviously I'm not going to go into too many details in order to avoid having too many spoilers, but I will say this: Phenomena has a great plot. It is intriguing and unexpected, it keeps you guessing all the way through. It kind of has a Friday The 13th kind of vibe to it when it comes to giving away who the killer is: you see many point of view shots or shadows of the killer, but you don't find out who it is until the very end. This does let it down slightly though, as the character who turns out to be involved with the killings is very undeveloped and underwritten within the plot, and by the time they appear and it is hinted that they are in fact involved, you've already forgotten who they are. I also thought that the death of this same character was a little contrived. But perhaps that's just me nitpicking, because really Phenomena's plot developed very smoothly and was very easy to understand. Dario Argento really did a fantastic job of writing this one. 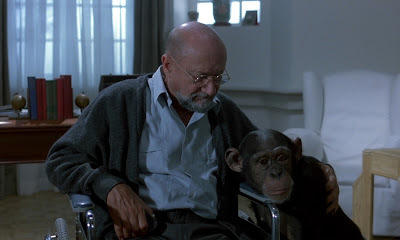 He even added little touches of his own personality here and there: for example, the scenes where Jennifer tells her roommate that her mother abandoned her family on Christmas Day - this is something that Dario Argento's own mother did, so perhaps putting this into one of his movies was his own personal way of dealing with it? I like that, that's what art is all about in my opinion. The acting of Phenomena was good, although nothing groundbreaking. Well, except for Donald Pleasence (he played Ernst Stavro Blofeld in the James Bond film You Only Live Twice) who really stood out, and was definitely the best actor in the whole film. 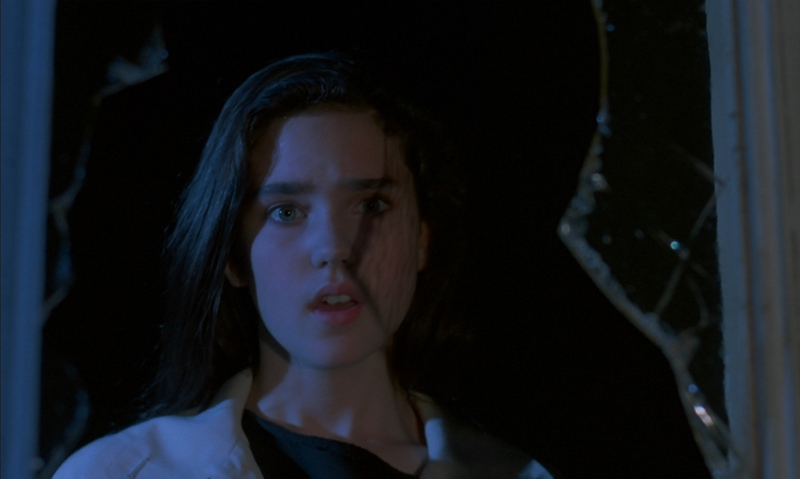 The main actress in the movie, Jennifer Connelly, was really good too, especially for her second movie role ever. Sometimes her line delivery could be a little unconvincing, but overall she plays a very convincing and believable character. All the other characters were decent too, especially the monkey... who was a boss. The music of the film was effective, although very overpowering in some instances. There was a score composed for the film that sounds great and really quite spooky, but then out of nowhere, heavy metal bands like Motörhead and Iron Maiden are tossed into the soundtrack (probably as a way of lassoing in viewers, as some posters for the film advertise the inclusion of music from these bands like they are some kind of selling point) and although I really like both of these bands, the songs that are featured in this film (although great) do really break the immersion and the creepiness for me. Nevertheless, the film is still really creepy, and very much disgusting in places (if you watch the film you will understand what I mean). The film really drags you into a comfort zone at some points before reminding you that no one is safe. I was scared to sleep after watching it, and I'm usually alright with horror films. Overall, Phenomena was an enjoyable experience from start to finish, and definitely something I would suggest any fan of the horror genre or film in general should watch. I guess it has become fairly obscure over time due to it only really being a hit in Italy, the home of Dario Argento (although the film is in English) and nowhere else really. You can still buy it on region 1 and 2 DVD however, but if you do, make sure you don't buy the 'Creepers' version, which is heavily edited and misses out the little details that make the experience of Phenomena such a memorable one.